The leaders of civil engineering broke out black ties and evening gowns Thursday night for ASCE’s annual springtime celebration of outstanding people and projects – the OPAL Gala. The event feted the lifetime achievements of the five Outstanding Projects and Leaders honorees for 2015, as well as the Pankow, Michel, and Excellence in Journalism award winners, capped by the announcement of the Halley VI Antarctic Research Station as the winning Outstanding Civil Engineering Achievement project. 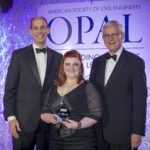 The 2015 OPAL award trophies were presented to five renowned civil engineers whose career achievements have contributed to significant advancements in civil engineering. ASCE Executive Director Thomas W. Smith III, ENV SP, CAE, F.ASCE, far left, and ASCE President Robert D. Stevens, P.E., F.ASCE , far right, joined the proud recipients: Andrew K. Phelps, P.E., M.ASCE, for construction; Thomas D. Rust, P.E., M.ASCE, for government; Nicholas DeNichilo, P.E., M.ASCE, for management; Edward J. Schmeltz, P.E., F.ASCE, for design; and Bernard Amadei, Ph.D., Dist. M.ASCE, NAE, for education. Listen to the inspiring acceptance speeches of ASCE’s 2015 OPAL award winners in the videos below. Pile Dynamics Inc.’s Thermal Integrity Profiler is the winner of ASCE’s 2015 Charles Pankow Award for Innovation. TIP is based on a technology that uses the heat generated by curing cement (hydration energy) to evaluate the integrity of cast-in-place concrete foundations such as drilled shafts, bored piles, micropiles, augered cast-in-place, continuous flight auger piles, and drilled displacement piles. The technology also can evaluate the shape of slurry walls and other concrete structures. 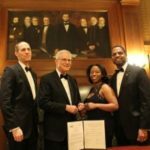 Jessica Morrison, a science journalist, was honored as the winner of ASCE’s 2015 Excellence in Journalism Award for enhancing public understanding of civil engineering. Her award-winning article for NOVA Next, a website affiliated with the PBS documentary series NOVA, “How Engineers Use Ground Freezing to Build Bigger, Safer and Deeper,” appeared on the site in October 2013. 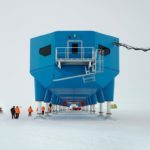 The first fully relocatable polar research facility, the Halley VI Antarctic Research Station, was named the winner of ASCE’s 2015 Outstanding Civil Engineering Achievement award. Designed by AECOM of Reston, Va., and Hugh Broughton Architects of London, the Halley VI is segmented into eight modules, each atop ski-fitted, hydraulic legs that can be raised to overcome accumulating snow, or to be towed to a new location. Accepting the 2015 OCEA award was Peter Ayres, BEng, CEng, MICE, MIStructE, director of Building Engineering for AECOM and strategic development director of the Halley VI. ASCE President Robert Stevens, center, and Executive Director Thomas W. Smith III, right, joined in presenting the award. Other OCEA finalists were the Colton Crossing Flyover rail project of Colton, Calif.; the Echo Park Lake Rehabilitation Project of Los Angeles; the San Francisco–Oakland Bay Bridge New East Span; and the Ward County Water Supply Project of West Texas. Learn more about Halley VI and view a video as presented at the gala. President Bob Stevens (top row, left) and Executive Director Tom Smith (top row, middle) celebrated the Distinguished Members who attended the Gala. Top Row: Stevens, Thomas A. Lenox, Ph.D., Dist.M.ASCE (2013), Smith; Daniel W. Halpin, Ph.D., Dist.M.ASCE (2006); Albert A. Dorman, P.E., L.S., Dist.M.ASCE, NAE (1993). Middle row: Lily Prakash; Delon Hampton, Ph.D., P.E., Pres.00.ASCE, NAE (1995); Bernard Amadei, Ph.D., Dist.M.ASCE, NAE (2009); Clifford J. Schexnayder, Ph.D., P.E., Dist.M.ASCE (2009); Jon D. Magnusson, P.E., S.E., Dist.M.ASCE (2008). Bottom row: Shamsher Prakash, Ph.D., P.E., D.GE, Dist.M.ASCE (2011); Richard N. Wright, Ph.D., P.E., Dist.M.ASCE, NAE (2002); Billy L. Edge, Ph.D., P.E., Dist.M.ASCE (2009); John M. Dionisio, P.E., Dist.M.ASCE (2013); Gerald E. Galloway, Jr., Ph.D., P.E., Hon.D.WRE, Dist.M.ASCE, NAE (2006). Front row, left to right: William E. Manz, P.E., F.ASCE; Douglas J. Sereno, P.E., ENV SP, F.ASCE; M. Arockiasamy, Ph.D., P.E., P.Eng, F.ASCE; Mark W. Lorah, P.E., F.ASCE; John E. Durrant, P.E., F.ASCE; Robert D. Stevens, Ph.D., P.E., F.ASCE, 2015 ASCE President; Thomas W. Smith III, ENV SP, CAE, F.ASCE, 2015 ASCE Executive Director. Middle row, left to right: Joseph M. Viola, P.E., F.ASCE; Ayman Abdel Mohsen Shama, Ph.D., P.E., LEED AP, F.ASCE; Thomas A. Grogan Jr., P.E., S.E., F.ASCE; Michael R. Sanio, ENV SP, CAE, F.ASCE; G. Douglas White, P.E., F.ASCE; Amar A. Chaker, Ph.D., F.AEI, F.EMI, F.ASCE; Chin Man W. Mok, Ph.D., P.E., P.G., G.E., D.WRE, D.GE, F.ASCE; Jeffrey J. Earhart, P.E., F.ASCE. Back row, left to right: Anthony F. Leketa, Sr., P.E., F.ASCE ; Andrew K. Phelps, P.E., F.ASCE; Thomas V. Edgar, P.E., Ph.D., F.ASCE; Asif Faiz, Ph.D., P.E., F.ASCE.